Rhonda Medina during their brunch and dinner shows. “Comedy is more than a show business industry,” Gunderson said. “It is an art form and we’re building the shrine that has been due to comedy for a long time.” Lucille Ball, the Queen of Comedy, and Jamestown, New York are the natural choice for that national shrine. America’s Comedy address is indeed 14701. Jamestown has happily grown accustomed to welcoming America’s funniest comics and biggest names in comedy every year. Year after year the star studded lineup gets even more exciting than the year before. 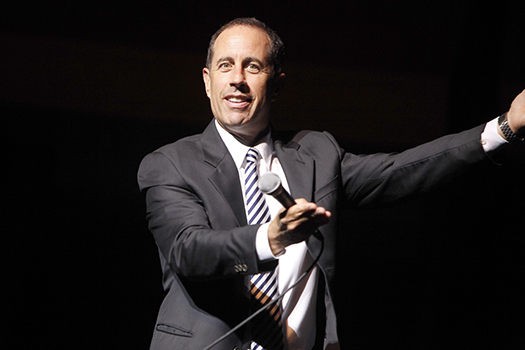 This year’s headliners, Nick Offerman and Jerry Seinfeld are teaming up behind the footlights with the children of legendary comics Joan Rivers, Harold Ramis and George Carlin, to once again make Jamestown the nation’s most popular comedy venue for comics and fans alike. Ground breaking for America’s new home for comedy – the National Comedy Center – is slated for Saturday, August 1 at 2:00 p.m. on W. 2nd Street in front of the former Jamestown BPU building, right beside the site of last year’s wildly successful Guinness Record Breaking Grape Stomping melee. 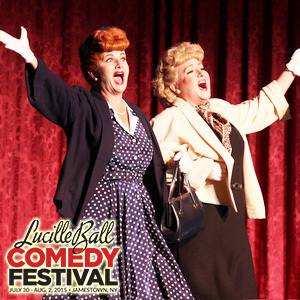 This year’s Lucy Fest stars, including family members of Milton Berle, iconic pioneer of television comedy, will be on hand to help celebrate the first shovels full of dirt turned over in the building of comedy’s new home. Fundraising for the nearly $20 million project is well under way and a gala housewarming for the new National Comedy Center is projected for the very near future. This year’s Lucy Fest guests will also include 20,000 of Jamestown’s closest friends who will once again contribute at least $3 to $4 million or more to the Greater Jamestown and Chautauqua County economy. Hotels, restaurants and local merchants will once again roll out their welcome mats. 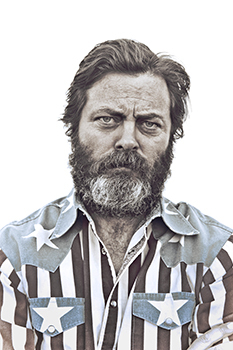 Nick Offerman, the quirky woodworker, Ron Swanson, on NBC-TV’s hit comedy series “Parks and Recreation” will take to the stage at the Reg Lenna Center for the Arts on Friday, July 31 at 8:30 p.m. Offerman’s work on “Parks” earned him a Television Critics Association Award for Achievement in Comedy in 2011 and two Critics’ Choice Television Award nominations for best supporting actor in a comedy series. Offerman has appeared in 36 major motion pictures and countless episodes of more than 30 popular television series since 1997, yet he also enjoys a separate career as a passionate and professional boat, furniture and ukulele builder. He is a master wood craftsman. Offerman’s standup comedy show, including adult material, promises to be one of the most unique and side splitting experiences Lucy Fest will host. A limited number of tickets are still available. Few names in comedy loom as large, as beloved and sometimes as controversial as the late George Carlin. 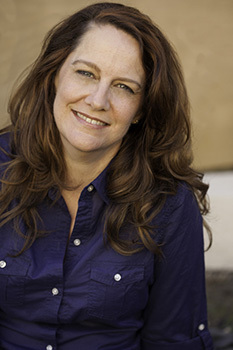 Kelly Carlin, Georges daughter, will present “A Carlin Home Companion: Growing Up with George” on Saturday at 3:30 p.m. at the Reg Lenna Center for the Arts. “This show is for my father’s fans,” Carlin added. “I want them to be able to say goodbye to him and say hello to me.” Emerging from her father’s shadow, Kelly tells a hilarious, touching, sometimes loving and intimate story about her passionate and complicated father who was a comedic genius but so much more than a comic. A highlight and signature event of the 2015 Lucille Ball Festival of Comedy will be a once-in-a-lifetime conversation moderated by Kelly Carlin called “Comedy Legacies: Rivers, Ramis and Carlin” held on stage at the Reg Lenna center for the arts at 6 p.m. on Friday. Violet and Julian, two of Harold Ramis’ children, will join Joan Rivers’ daughter Melissa in a fascinating set of interviews and conversations about the joys and trials of being the child of a comic legend. The late Harold Ramis is most famously known for his role playing Egon Spengler in Ghostbusters and as writer/directors of Caddyshack, Groundhog Day, National Lampoon’s Animal House and many others. The late Joan Rivers was simply a comedic force of nature and a past headliner at Jamestown’s Lucy Fest. 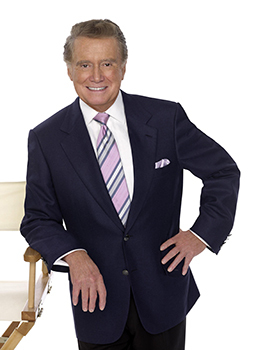 A television legend himself, and a Guinness Book world record holder for more time in front of a television camera (nearly 16,000 hours, 1961 to 2006) than any other performer in history, Regis Philbin will host the “Letterman Senior Staff Panel” at 5:30 PM on Thursday at Jamestown’s Willow Bay Theater. This will be the first time since David Letterman’s retirement that his long-serving staff and crew will gather to tell the world how they crafted Letterman’s late show and late night for the last 33 years. Regis and Jamestown will make history together at the 2015 Lucy Fest. 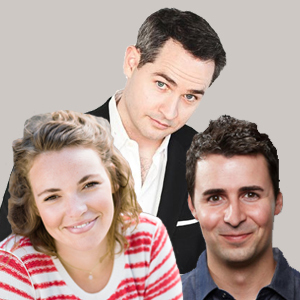 (L to R) Beth Stelling, Pat McGann, and Pete Lee, will be performing during the Stand-Up Showcase on July 30. Jamestown’s own local talent will also be a big hit in the 2015 Comedy Festival. Many of Lucy Fest’s 50 events this year will be special “Friend of Fest Events” staged throughout Jamestown and its theaters, along with the events produced by the National Comedy Center. The Lucille Ball Little Theater at 18 E. 2nd St. in downtown Jamestown will stage three performances of high octane fun on “Route 66”. The Texaco Pump Boys will delight audiences singing original and a few contemporary renditions of 34 of the 20th Century’s greatest “Rock n’ Road” musical hits from the 1950s and 60s. Find out more about Route 66 at the Little Theater on page 24. Other locally produced Friend of Fest events will include Thursday and Friday performances of the unauthorized parody of the Peanuts comic strip characters in “Dog Sees God” at the Spire Theater. On Friday afternoon a free Laughter Workshop will be on tap for all at the Jamestown Gateway Train Station and special, free, Fans of Lucille Ball presentations at the Dykeman-Young Gallery will be offered all day from Thursday through Sunday. The Unexpected Guests Improv Comedy Show, veterans of more than a decade entertaining Western New York audiences, will take to the stage at 10 p.m. on Friday night at the Reg Studio Theater. Nameless! Improv comedy, including the surreal and the bizarre, will entertain audiences at 7 p.m. on Saturday evening at The Forum to round out the special Friend of Fest events produced by Jamestown’s own outstanding local talent. A signature event of the 2015 Lucille Ball Festival of Comedy will be the Saturday, August 1st Groundbreaking Ceremony for the National Comedy Center. The public is invited to join this year’s comedy stars and be part of the show. To see the entire Lucy Fest schedule and to buy tickets, visit http://www.lucycomedyfest.com/. According to Journey Gunderson, guests come to see the comedy, but the people of Jamestown are part of the Comedy Festival’s great success. As hosts to our out-of-town visitors, we can be as memorable as the stars. Previous articleLife is a Joke.